With the crash of a brand-new Lion Air Boeing 737 MAX off the coast of Jakarta on Monday, armchair experts have rushed to judgement on this brand-new aircraft type. So for today’s Throwback Thursday article from the Australian Aviation archives, we revisit this April 2016 feature that delves into the comprehensive development history of the 737 MAX program. Somewhere across the world a Boeing 737 takes off or lands every five seconds and more than 1,200 of their compatriots are aloft at any given time. With the total number of Boeing 737s that have been built approaching 9,000, this twin-engined airliner has truly earned the term ‘prolific’ to be used in its description. And while the maiden flight of the 737-100 took place in 1967, there is no sign of the 737’s popularity abating as evidenced by the rise of its latest offspring – the 737 MAX. The 737 design has been tried and tested for nearly 50 years. With each generational change, Boeing has sought to build upon the core product and enhance it with the newest technologies on hand, and the 737 MAX is the ultimate example of this. Boeing has sought to build upon the core product. In the modern era, efficiency is the key requirement for airlines. They want their aircraft to be leaner and greener and yet possess an enhanced level of performance. As a result, manufacturers look towards the age-old challenges of weight and drag and their co-existence with the pursuit of power. Consequently, three major areas contribute to the answers – aerodynamic design, powerplant and materials. 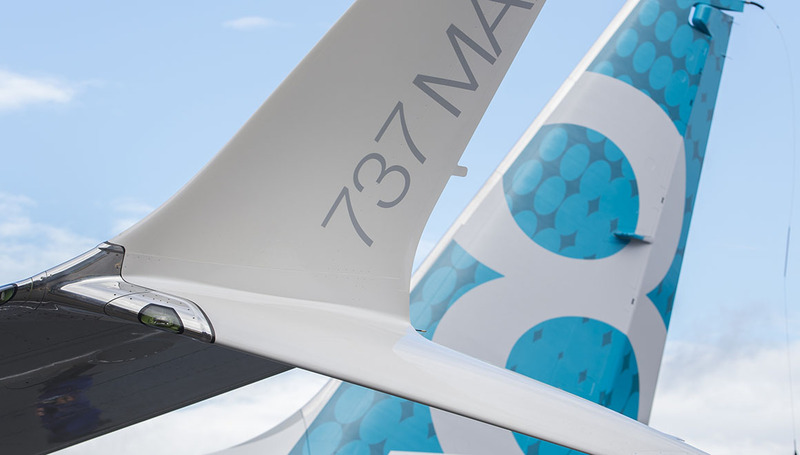 The eye-catching feature of the 737 MAX is the new style winglets. While airlines started retro-installing split scimitar winglets on 737s in 2014, the new Advanced Technology (AT) all-composite winglets were exclusively designed as part of the 737 MAX wing. All 737 MAX aircraft will be delivered with the AT winglets as standard and alone they contribute up to 1.8 per cent in fuel savings. With their greatest efficiency in the cruise, the longer the flight, the greater the benefit. Interestingly, the ailerons and tabs found inboard of the AT winglets will be produced by Boeing Aerostructures Australia in Port Melbourne. At the heart of the 737 MAX is the new technology CFM LEAP-1B engine. Throughout aviation history, successful aircraft have always been characterised by a strong, well-matched combination of airframe and powerplant and the 737 is no exception. Growing out of the tremendous success of the established CFM56 engine, the LEAP possesses a fan diameter that is 23cm greater than its predecessor. Thrust ratings on the 737 MAX LEAP-1B engines are about 1,000lb higher than the same ratings on the 737NG and range between 23,000lb and 28,000lb. Even so, while increasing the power output, the latest quiet engine technology will still result in an approximately 40 per cent reduction in community noise. The LEAP combustor also reduces NOx emissions by 50 per cent compared to current CFM56 engines with identical overall pressure ratio. All the while, the LEAP-1B will provide a 15 per cent specific fuel consumption (SFC) improvement over the CFM56 engine which, when combined with other 737 MAX enhancements, results in an overall fuel efficiency improvement of 14 per cent compared to current production 737NGs (and more than 20 per cent over early-build NGs). Central to the LEAP-1B’s success are advances in engine technology including the use of new materials. The LEAP engine will be the first to introduce ceramics matrix composites (CMC) into commercial service. The engine will feature a CMC shroud in the first stage of the high-pressure turbine. Interestingly, it takes 150,000 miles of carbon fibre to create a single LEAP fan blade, but that one blade is so strong it can support the weight of a Boeing 787. When the 737 Next Generation (NG) first emerged from the production line, its tall, blended winglets immediately caught the eye. The new AT winglets are equally noticeable, but the development of the MAX extends well beyond these aerodynamic devices. And in the same manner that the NG built upon the original ‘classic’ 737, many of the MAX’s new features are seamless for the crews that operate them. Consequently, NG pilots will only require minimal classroom training to be qualified on the MAX. NG pilots will only require minimal classroom training to be qualified on the MAX. Some of the changes to be incorporated in the MAX’s systems include fly-by-wire (FBW) spoilers, an electronic bleed air system and larger flightdeck instrument displays. The fly-by-wire spoiler actuation sends electrical signals rather than the previous mechanical system, with a corresponding reduction in weight. Similarly, the bleed air system that controls cabin pressurisation and ice protection systems was previously pneumatically controlled. The new electronic system allows for increased optimisation which in turn equates to improved fuel efficiency. Deeper into the digital workings of the MAX exist further developments. The MAX will include an enhanced onboard network system (ONS) comprised of a network file server (NFS) and an enhanced digital flight data acquisition unit (eDFDAU). These systems will provide a new set of capabilities to process data in real time and will also leverage the available connectivity for secure communications with ground‑based systems. This will support airline operations such as remote software part transfers from the airline back office, or analytic capabilities with the Boeing Airplane Health Management (AHM) system and an electronic logbook (ELB). The 737 MAX will provide real-time data to the ground about its systems during flight, making it easier for airlines to make operational decisions around maintenance. On the ground, the MAX features a more centralised built-in test equipment (BITE) system that technicians can access after a flight. The MAX will have additional systems reporting BITE and maintenance data so technicians can better assess dispatch limitations and maintenance actions. Yet for all the new developments, there are still commonalities with the NG. Firstly, the fuel capacity of the 737 MAX is the same on the NG 737 models. Even so, the MAX will extend the NG’s range to fly more than 3,500nm, equating to an increase of 340-570nm thanks to the improvements in efficiency. Common ground with the NG means that a significant percentage of the 737 NG spares that airlines already possess will carry over to the 737 MAX. Similarly, while the engines and winglets draw upon new materials, a good many components elsewhere have been kept common to the NG. For passengers, the Boeing Sky Interior that comes as an option on the NG will be standard on the 737 MAX. The MAX order book has grown steadily and now stands at 3,072 orders to date and spanning 62 customers worldwide. Of the four models available, the 737-8 is – like the 737-800 before it – proving the most popular with more than 2,600 aircraft on order. Locally, Virgin Australia has orders for 40 737‑8s, due for delivery from 2018, while Air Niugini recently signed up for four. On January 29, the first Boeing 737 MAX, with its new LEAP-1B engines and its distinctive winglets, and proudly bearing the Spirit of Renton name, took to the skies for the first time. It was an event that was beamed live across the internet and caused quite a stir on social media. 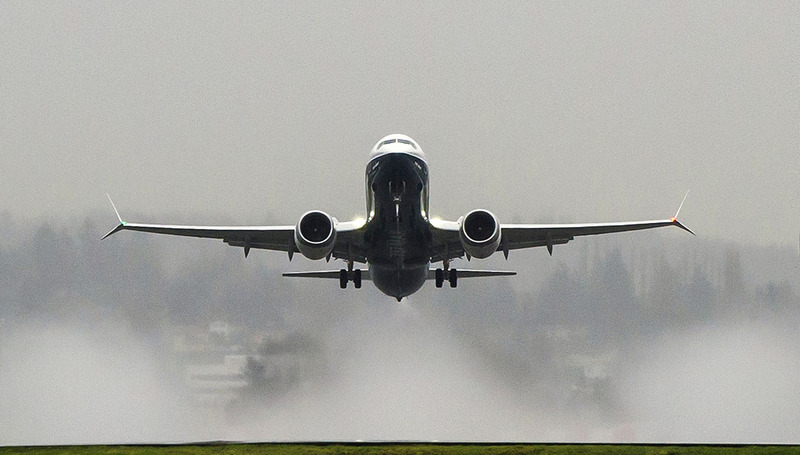 With 737 MAX chief pilot Ed Wilson and Boeing chief test pilot and vice president of flight operations Craig Bomben on board, the MAX undertook an initial flight lasting nearly three hours. A Boeing video detailing the 737 MAX’s first flight. During the flight, the 737 MAX reached a maximum altitude of 25,000ft and an airspeed of 250kt, which is typical of a first flight sequence. The crew tested the aeroplane’s systems and structures while onboard equipment transmitted real-time data to a flight test team on the ground in Seattle. 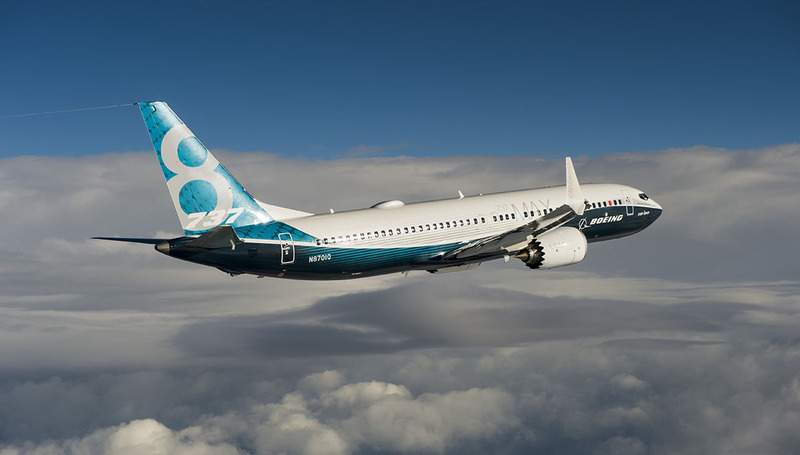 Boeing Commercial Airplanes senior vice president and general manager for airplane development Scott Fancher subsequently detailed how the 737 MAX program was progressing ahead of schedule and described the first test flight as “flawless”. “The pilots reported the airplane behaved exactly as we expected, no drama. That’s what I call a successful first flight,” Fancher told reporters during a media briefing at the Singapore Airshow in late February. 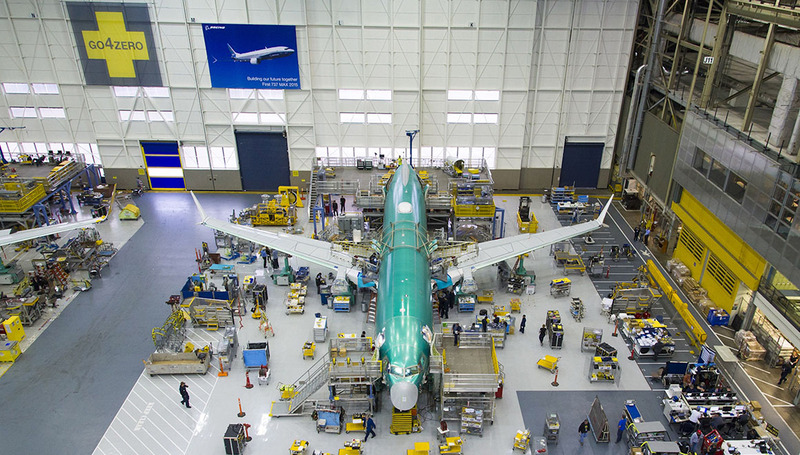 With the other three members of the 737 MAX 8 flight test fleet currently in different stages of final assembly and the second MAX making its maiden flight on March 4, the 737 MAX remains on track for first delivery to Southwest Airlines in 2017. The start of the flight testing and the commentary about the good progress of the MAX certification program has raised speculation the manufacturer may be in a position to deliver the first aircraft to launch customer Southwest Airlines before the publicly stated third quarter of 2017. However, Boeing’s Fancher did decline to offer any guidance when asked how far ahead Boeing was on the MAX flight test program or if the company had had any discussions with airlines about potential early deliveries. “I am not going to comment on discussions we may or may not have had with customers,” he said at Singapore. For now, Boeing will methodically expand the flight envelope in order to prepare the rest of the flight test fleet to progress through different test conditions including takeoff performance, NAMS (nautical air mileage), ground effects, community noise and different environmental conditions including high altitudes, hot and cold temperatures and cross‑winds. Furthermore, in the flight test program, Boeing has built into its testing plans a phase where it will “operate like an airline” to simulate airline operations in revenue service to validate the aircraft design, maintenance manuals and on-board products prior to entry into service. The program consists of common airline practices and use of customer manuals, equipment and tools. In service, the 737NG has achieved an enviable schedule reliability record of 99.7 per cent and this is a record the MAX is working hard to build upon as delays and cancellations equate to loss of both revenue and the goodwill of passengers. The original 737 has been described as a ‘classic’, while its wingleted offspring heralded in the Next Generation. Now, the 737 MAX will be 14 per cent more fuel-efficient than today’s 737 NGs, flying farther, quieter and with less impact on the environment. The newest breed has now arrived and is set to not only carry with it all that is good about the 737 but to go even further and take it to the MAX.